Do you suffer from oily skin or a shiny face that just won't go away? Have you tried just about every mattifying product in the makeup aisle? Well I have something here that you haven't tried but works wonders. It is called tu'el Absorb Mattifying Serum. If you are saying, "Dear Shiny Face, Please Go Away!" then this if for you! Gel real oil control and shine-free face with Absorb. 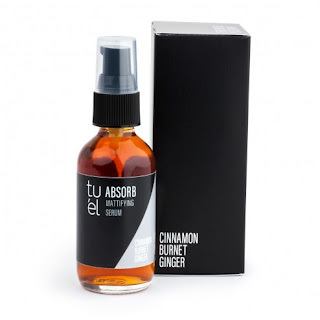 This product is powered by natural plant extracts of burnet, cinnamon, ginger and green tea to control oil, to inhibit breakouts and to leave your skin looking fresh and matte ALL day long. Sodium Hyaluronate helps to lock in hydration so you don't feel dry and your skin does not feel like its been tested all day long. It helps to give yourself flow without the shine. The best way to use Absorb is to apply every morning to the face and neck then let dry and apply moisturizer. It is best to apply tu'el Daily Protect Oil Free Moisturizer. It works perfect under makeup, thus leaving you red carpet ready all day long. When I first tried it I was a little skeptical. I have tried products that have said that they would leave me matte all day, especially foundations. You can understand my skepticism. So I used it and waited all day long, looking in the mirror periodically. Every time I looked my skin still looked good. And the only thing I wore over it was a little bit of powder foundation. My skin tends to be a little oilier in the heat and drier in the cold. I tried it out in the heat. So I tried it again another day with a full face of foundation (harder to keep matte). And this was a full coverage foundation. Again, I checked the mirror periodically to see how it was working. And again, it worked great. I was very happy with this product. It did exactly what it said it was going to do. It kept my face shine free all day long. tu'el Absorb Mattifying Serum works wonders. tu'el Absorb Mattifying Serum can be purchased online at www.tuelskincare.com. Like tu'el on Facebook:https://www.facebook.com/pages/TueL-Skin-Care/210408939091568; Follow tu'el on Twitter:@tuelskincare; Follow tu'el on Pinterest:https://www.pinterest.com/tuelskincare/ and Follow tu'el on Instagram:https://www.instagram.com/tuelskincare/.